What do I love more than milk? Three kinds of milk!! Ever since my friend Sunni introduced me to tres leches, I have been hooked! I was a little nervous making this since Sunni only made things that were ridiculously complicated and had a chance of exploding, but I figured it was worth the risk. While I can't say if this is as good as hers (unfortunately it has been far too long for me to recall), it was pretty fabulous and I will most definitely be making it again. We had a progressive dinner this past weekend with several of our new neighbors and I volunteered to do the dessert course. As my neighbor Kevin would say, this cake was "stupid good". So good that I could only snag a lonely corner piece to take pictures of. Next time I hope to plan a little better and take some shots of it before its completely devoured. I always get nervous when trying out a new recipe, but this one from Cook's Country did not disappoint. My husband did suggest adding a little dulce de leche / salted caramel drizzle to it next time, but it was fabulous just on its own. So good that I'm even considering throwing tradition out the window and making it for Thanksgiving this year. And I'm not even kidding. ***UPDATE: Since this initial post, this recipe has become a staple in our household. It is so good that I haven't even bothered looking for another recipe. I hope you enjoy! Tres leches. Good for just about any time of day. Nom nom nom. For the milk mixture: Pour condensed milk into large microwave-safe bowl and cover tightly with plastic wrap. Microwave on low power, stirring and replacing plastic every 3 to 5 minutes, until slightly darkened and thickened, 9 to 15 minutes. Remove from microwave and slowly whisk in evaporated milk, cream, and vanilla. Let cool to room temperature. For the cake: Adjust oven rack to middle position and heat oven to 325 degrees. Grease and flour 13 by 9-inch baking pan. Whisk flour, baking powder, salt, and cinnamon in bowl. Heat butter and milk in small saucepan over low heat until butter is melted; set aside off heat. With electric mixer on medium speed, beat eggs in large bowl for about 30 seconds, then slowly add sugar until incorporated. Increase speed to medium-high and beat until egg mixture is very thick and glossy, 5 to 7 minutes. Reduce speed to low and slowly mix in melted butter mixture and vanilla. Add flour mixture in three additions, scraping down bowl as necessary, then mix on medium speed until fully incorporated, about 30 seconds. Using rubber spatula, scrape batter into prepared pan and bake until toothpick inserted into center comes out clean, 30 to 35 minutes (it took me the full 35). Transfer cake to wire rack and let cool 10 minutes. I know, I know. Its been eons since my last post! All I can say is that I've been busy with life. I've changed jobs, ran my first half marathon, and also built a house! Right next to planning our wedding, I think that building a house was probably one of the most stressful things I've ever done. But it has been completely worth it though. We really do have our dream kitchen and I have been baking up a storm ever since we moved in. A few weekends ago our sweet little niece Ava came over and we made banana cupcakes. I had only tried to make banana cake once before and it turned out awful. Little did I know how ripe your bananas need to be to make a good banana cake. Like they need to be on the edge of disgusting. Gabe offered to toss them out at least three times before they were ready. I used this recipe but made cupcakes instead of a sheet cake - and the batter makes a LOT of cupcakes, about 28 or so. I just added some walnuts to the batter and whipped up a batch of my go-to cream cheese frosting, but added the zest of one lemon for a little extra zing. It baked a ton faster for me than what the recipe said. I baked them at 275° and they were done after about 30 minutes in my convection oven. My niece Ava, such a huge helper in the kitchen! Preheat oven to 275°. In a small bowl, mix mashed banana with the lemon juice; set aside. In a medium bowl, mix flour, baking soda and salt; set aside. In a large bowl, cream 3/4 cup butter and 2 1/8 cups sugar until light and fluffy. Beat in eggs, one at a time, then stir in 2 tsp vanilla. Beat in the flour mixture alternating with the buttermilk. Stir in banana mixture. Pour batter into lined cupcake pans and bake in a preheated oven until toothpick inserted in center comes out clean. In a large bowl blend butter, cream cheese, lemon zest and vanilla together. Add in confectioners sugar in batches until completely blended. Frost cupcakes and enjoy! Note: I was short on frosting since this recipe made so many cupcakes, and I like to put quite a bit of frosting on my cupcakes. Next time I make these (and there definitely will be a next time), I will update this with how much is actually needed. I have a new found respect for cake decorators. I mean really. While I've always prided myself with being the artsy type there is a big difference between arts and crafts and creating things that are not only pretty to look at, but intended to be edible as well. 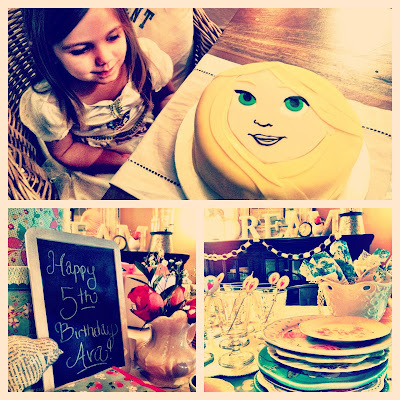 When Ava told me that she wanted a Rapunzel cake for her 5th birthday, I immediately thought about those dress cakes that my mom used to make me as a kid. My mom made it look so easy! I went out and bought Wilton's Wonder Mold and was shocked to discover that they still used the same dolls from the 1970's. Fortunately I was able to find a Barbie Rapunzel doll and figured I could engineer it somehow into the cake and all would be well. That was my first mistake. At the end of Wilton's suggested baking time for the cake it had the consistency of a Jello mold. Not good. I let it bake for another 30 minutes and finally it was cooked through. My second rookie mistake was that I didn't factor for the cake not being as tall as the pan itself. What did that mean? That meant that Rapunzel's dress was going to hit mid-thigh unless I removed her legs or chopped off her ankles. Not cute. And while I briefly entertained the idea, I was not about to dismember a $20 Barbie doll. My first Rapunzel cake was such a disaster that I didn't even take a picture. Come to think of it, I should have just so I could submit it to Cake Wrecks. It would've been a great addition to this post. So what now? 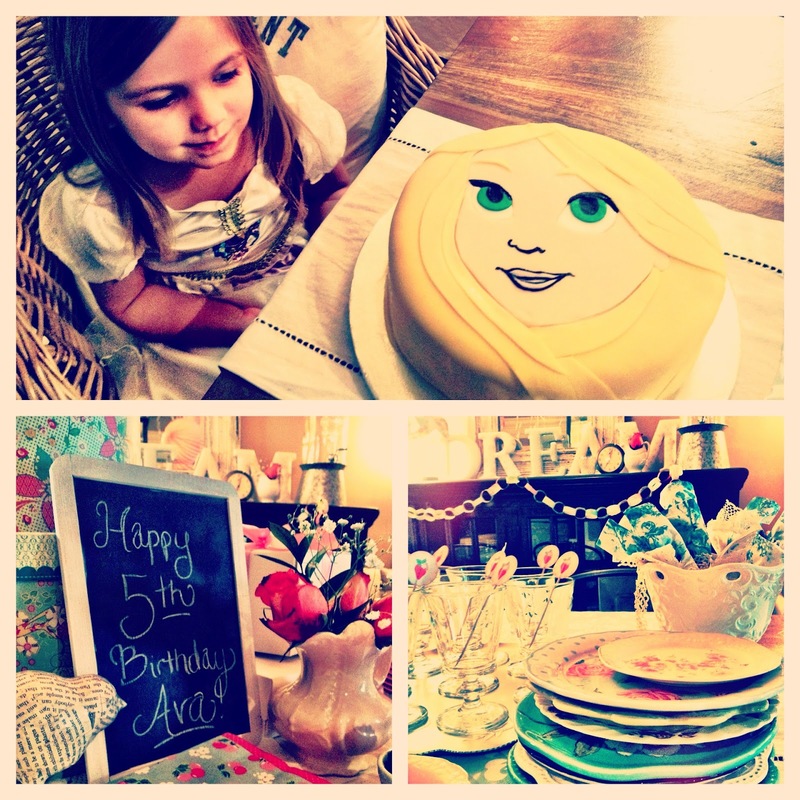 Only hours remained until Ava's birthday and I had nothing to show for it besides a disaster of a kitchen and a husband that was seriously questioning my sanity. Most people at this point would've just bought some cupcakes and called it a day. But not me. I decided to stick to what I know...well, somewhat. 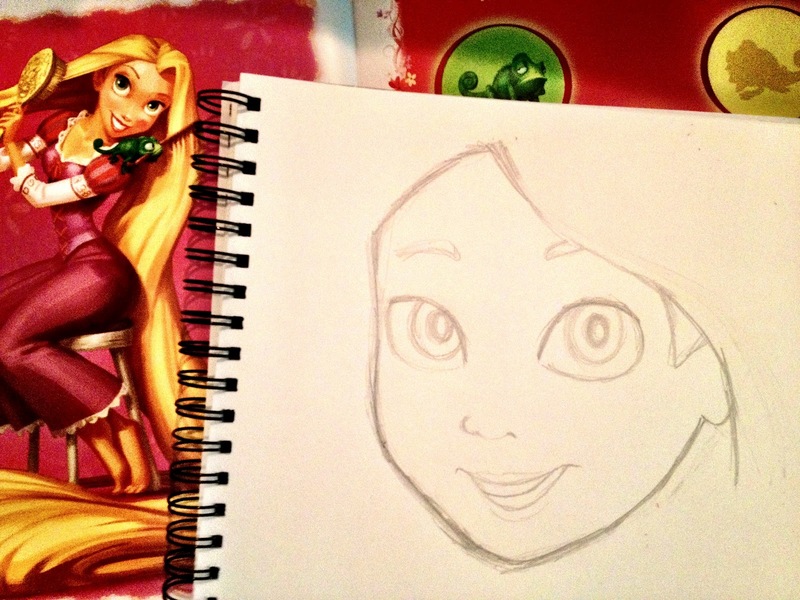 I was going to a layer cake and somehow make it look like Rapunzel. 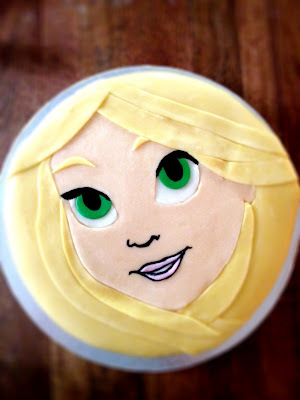 I drew a picture of Rapunzel and figured I could cut out all of the pieces in fondant, put it together like a puzzle and ta-da! That was my third mistake. Fortunately for me and sweet little niece Ava, my last mistake was still salvageable and I was able to cover all of my errors with fondant. I didn't take a ton of pictures because, well, I was literally giving Rapunzel eyebrows just minutes before we ran out the door. The final product was a two-layer strawberry cake with my standard cream cheese frosting (1lb powdered sugar, 1 stick of softened butter, 1 stick of softened cream cheese, 1t vanilla). Here is the cake recipe I used which I've made twice and its actually quite good. 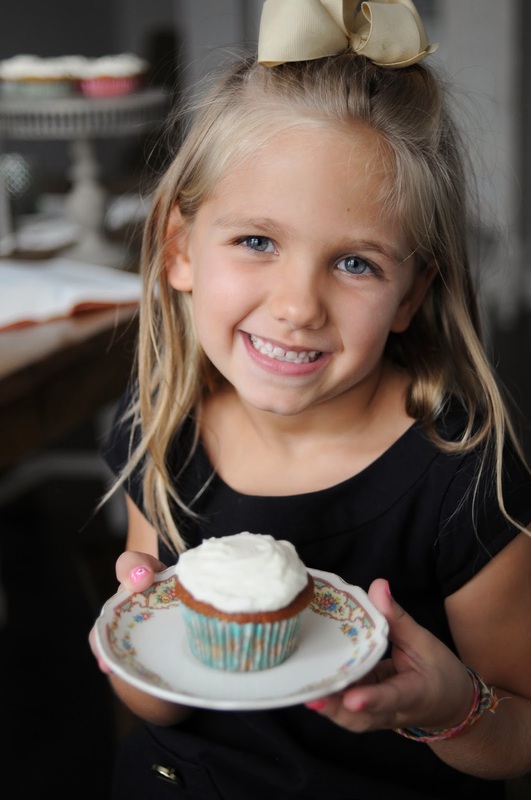 While it was quite the undertaking, it was well worth seeing the smile on Ava's face, especially after she told me that I am "the best cake baker ever." 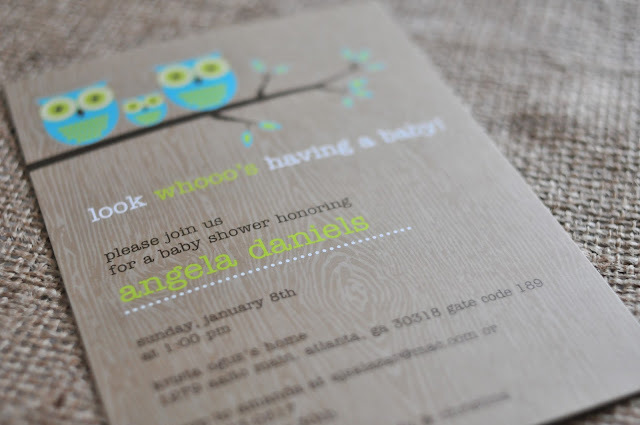 Last weekend I was honored to be able to help host my dear friend Angela's baby shower. It was my first time hosting a baby shower, and it was a lot of fun! 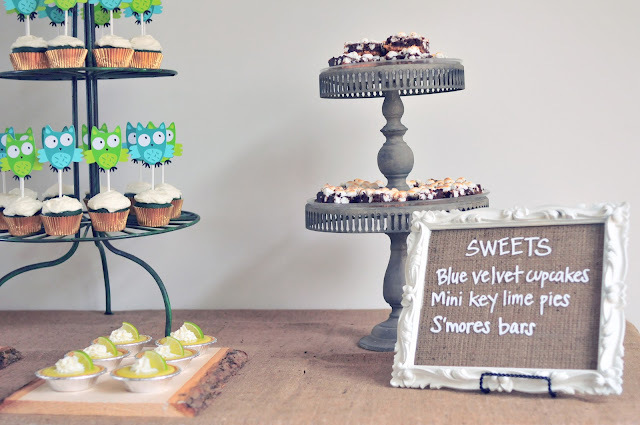 Since my wedding I've been mildly obsessed with dessert tables, and thought this would be a great opportunity to test my skills by creating a dessert table that incorporated our rustic, owl-inspired theme. Since the colors were turquoise and lime green I initially struggled with what I should make for the desserts, but finally decided upon doing a variation of my red velvet cupcakes (with a different colored food dye, of course), mini key lime pies and some s'mores bars. I'd never made key lime pie before but was delighted to discover how easy it was to make. Its definitely something foolproof that you can whip up in just a few minutes (if you use pre-made crust) that also tastes wonderful. For the decor I bought a bunch of burlap that I used to make a table runner, some fabric bunting and to line a frame that I used as a mock menu (I wrote with liquid chalk on the glass). I also found some wooden slabs at Michael's that I used to display the key lime pies on, and then used some of my miscellaneous cake stands and plates that I used for my wedding. All in all, I think it turned out pretty well although I would recommend some modifications to the recipes (see below). Happy Baking! Blue velvet cupcakes: I just used my standard red velvet cupcake recipe, omitted the red food dye (obviously) and used about 25 or so drops of neon blue food dye (it comes in a package with other neon colors). While I was going for a darker aqua color, they turned out a smidgen darker than I anticipated. I guess I'm used to being a little heavy handed with the red food dye, and didn't think that the neon colors would be so concentrated. The other option I thought would be to replace the cocoa powder with white chocolate powder which would result in a different flavor, but a brighter colored cupcake. 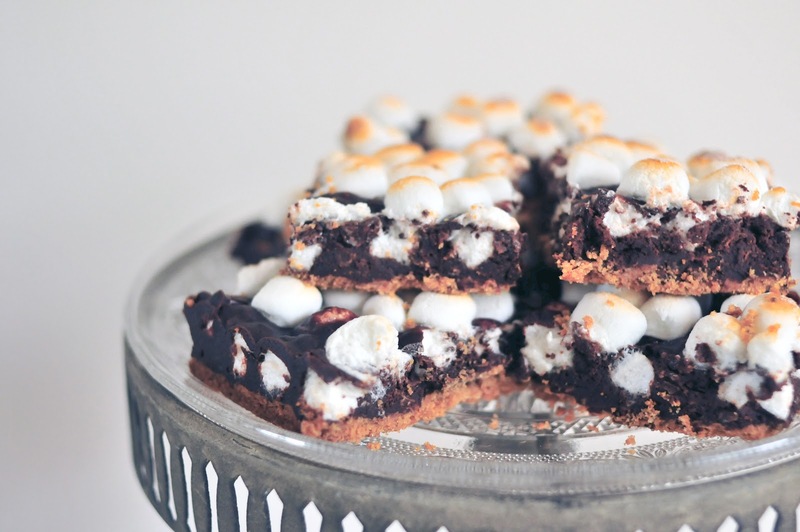 S'mores Bars: You can find the recipe here, but I recommend omitting the cocoa pebbles. They were tasty, but I think they would be considerably better without. It almost gave it a coconut flavor and texture that I wasn't a big fan of. I also thought that mixing Fluff (ie marshmallow cream) or Nutella into the chocolate would be pretty divine as well. Mini Key Lime Pies: I used this recipe from Emeril Lagasse and simply put the filling into mini pre-made graham cracker crusts. It was not only one of the easiest things I have ever made, but one of the best key lime pies I've ever had. I purchased key lime juice (not regular lime juice) since I didn't know where to buy key limes, nor did I feel like squeezing a ton of them. I did add a teeny-tiny bit of lime green food coloring to the filling to give it some more pop for pictures. I didn't bother making the topping with sour cream, but I'm sure its quite good as well from all of the positive reviews the recipe has. While it seems I may have taken quite the hiatus from baking and blogging, I have an honest to goodness excuse...I got married! For those of you that have ever planned a wedding, I know you understand where I'm coming from. Everything seems to take way more time than you expected and cost way more than you expected, too. But despite the hours upon hours of planning (with a few sprinkles of freak-outs here and there), I am happy to say that everything turned out wonderfully! While all of the decisions along the way, like which dress to buy, venue to book, etc, were all important to make, the best and most important decision of all was whom I chose to marry. My husband is such an amazing man and I feel so blessed to be able to spend the rest of my life with him. While I ultimately decided against baking all of the desserts for my dessert table (pictured below), I was able to find a bakery here in Atlanta called the Atlanta Cupcake Factory that met my rather high expectations and made some adorable and tasty cupcakes. I chose four different flavors to go along with our Vintage Southern theme including key lime pie, strawberry lemonade, sweet potato bourbon and of course...red velvet. Then I had them displayed on some vintage pieces I'd collected along the way. They were a hit - so much so that my groom and I weren't even able to try one! Apparently when you have several different flavors, it makes people want to try one of each. I'm wondering if this is why people do a cake cutting ceremony, so they are certain to have a piece of their own cake? The rest of our food was pretty fabulous too. We had mini pulled-pork sliders, green beans wrapped in bacon, BLT stuffed Campari tomatoes (yes more bacon), and other yummy Southern fare, courtesy of our caterer Beyond Details. We had such an amazing time, and now that the dust has settled a bit, I am going to start dedicating more time to my baking (and blogging). However, since I've had a recent obsession with chocolate salted caramel, I may be infusing some posts of the non-red velvet variety. I hope that is cool with all of you folks! Stay tuned for some holiday inspired posts, and have a Happy Thanksgiving! If you are remotely interested, you can find some more of our wedding photos by Andrew Thomas Lee here, or you can check out our wedding trailer by Rodinis Films below. Christina + Gabe from Ryan Rodinis on Vimeo. Have Your Red Velvet and Drink it Too! When I first decided to blog about red velvet, many people said I was crazy. "How on earth can you just blog about red velvet?" they asked. "Won't that get a little repetitive, and well, boring?" Little did they know this lesser known cake that fell out of favor in the 1970's due to the Red No. 2 food dye scare, would come back with a vengeance -- making its way into our favorite recipes, and subsequently, into our hearts. 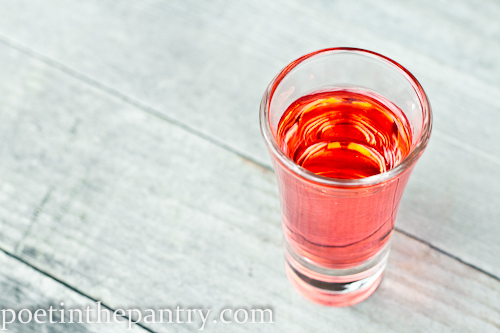 To all of the naysayers, I present to you a red velvet cocktail shot. Yes, the cake we both know and love has now made its way into liquid form, to be consumed and enjoyed in 1oz doses. I think its safe to say that once a drink has been named after something, that it is officially mainstream. I'm not sure if a drink can possibly taste like red velvet, but its worth a shot (pun intended). You can find the recipe here. Oh, and just for good measure I think the shot should be enjoyed in one of these. I'm obsessed with this color right now. As many of you probably know from my earlier posts, I recently got engaged and am in full planning mode. Planning a wedding is no easy task, especially when you are on a tight budget. My fiance and I have been trying to find ways to cut costs, and also to make the wedding reflective of who we are as a couple. So recently I've been toying with the idea of baking for my own wedding. But not just the obvious red velvet cake. 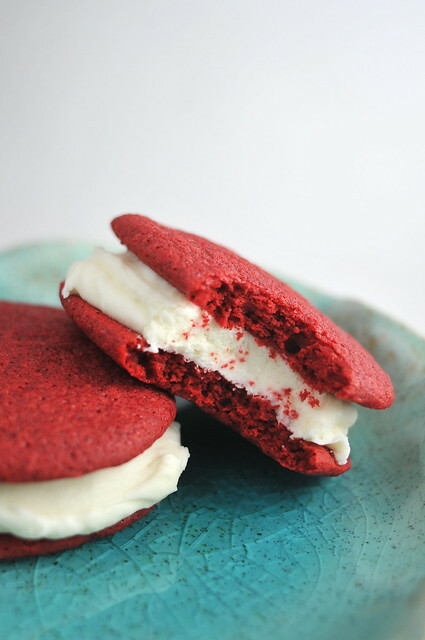 I'm thinking a whole dessert table chock full of red-velvety goodness. Red velvet cupcakes, red velvet cake balls, red velvet double doozies, red velvet trifle, red velvet cheesecake...I think you get the picture. Here is my thought process: if the base recipe for several of these is the same (cake balls, trifle, cupcakes, etc), would it really be that difficult to make enough of these things to feed 100 people? Mind you, I'd probably need to make all of it 1-2 days prior to my wedding. I'd love to get thoughts from anyone who's attempted something like this before. Now onto the giveaway, my fiance and I have entered Crate & Barrel's Ultimate Wedding Contest, and are just 100 or so votes away from advancing to the next round. We could really use your help and support, but of course I want to offer you something in return. I love everything about Anthropologie, and I think that every baker (or cook) should have one of their fabulous little aprons. My fiance actually bought me one for Christmas and had it embroidered with "The Velveteen Baker". I absolutely love it, and even when I'm covered in flour and red food dye, I still feel fabulous in it. So here is the deal. One lucky winner will get to take their pick of one of these chic aprons from Anthropologie. There are three ways to enter, so even if you've already voted for us you still have a chance to win. Vote for my fiance and I in Crate & Barrel's Ultimate Wedding Contest http://www.ultimateweddingcontest.com/entry/126647 (detailed instructions below), then come back here and comment on this post which number vote you were (ie "Vote #525"). If you’re on Twitter, receive an extra entry by tweeting the below (tell me you’ve tweeted, by leaving an extra blog comment): "Win an @Anthropologie apron from @velveteenbaker: http://bit.ly/gSK5Gc #giveaway"
Get an extra entry if you post about this contest on your blog, or share it with your friends on Facebook asking them to vote for us. Must include this link http://bit.ly/hlTRaL (again, leave an extra blog comment here so I know you posted). One winner will be randomly selected. Anonymous comments, or those that don't follow the instructions will not be counted. If I am not able to contact the winner, another winner will be selected. Entries will be accepted until noon on Sunday, April 24th (EST) and the winner will be announced and contacted shortly thereafter. UPDATE: I AM EXTENDING THIS CONTEST UNTIL APRIL 29th! I'm still getting more entries come in and I feel awful not including them. Besides, we still need more votes (can you blame me?). Thanks so much for the support!! Winner will be announced after April 29th. STEP 3: Scroll down and either Login with Facebook -OR- Register with your email address. STEP 4: Click "Allow" for Request for Permission. It will take you back to the contest page and a pop-up that says your vote has been counted will appear. STEP 5: Come back to this post and comment which number you were back here (ie "Vote #525" - you'll see it on the contest page). STEP 5: Check your email for a message from "Ultimate Wedding Contest" and click to confirm your address. It will take you back to the contest page and a pop-up that says your vote has been counted will appear. STEP 6: Come back to this post and comment which number you were back here (ie "Vote #525" - you'll see it on the contest page). I've picked a winner! The winner was randomly selected using random.org after any incomplete or anonymous entries were removed. 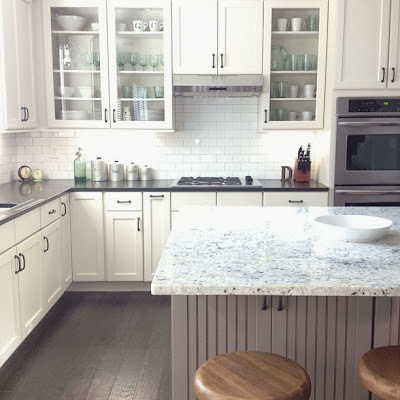 And the winner is...comment #34, Krista from In Krista's Kitchen. Congratulations Krista! I'll be emailing you with details so you can pick out which fabulous apron you'd like to have! Love the pleats and cute little bow! Ah, Valentine's Day. Love is in the air and red velvet - or anything red or heart-shaped for that matter - is selling like hotcakes. I don't know about you, but for the longest time I had mixed feelings about Valentine's Day. Considering my Facebook status had long been "single" (or otherwise "complicated") for the latter part of my 20's, I guess you could say I was a little bit jaded. But February 14th, 2010 completely changed my perspective on the holiday. People always say that you find love when you stop looking, and I couldn't agree more. I used to think that phrase meant you had to completely give up first, or just not appear to be looking, but neither of these are true. Without going all Tony Robbins on you, it finally dawned on me that I had to stop looking outwards, and instead look inwards and try to be the right person for someone else. I made lots of lifestyle changes and lots of decisions. None of it was easy, but had I not gone through that process I'd probably still be bitter, party of one. Now fast forward to Valentine's Day last year. It was Sunday and I'd gone to the 6pm service at Buckhead Church. My good friend Julie, as cute as she is, brought us all little Valentine's treats. After service, she asked if I wanted to go to a Fusion event (a gathering for non-marrieds at Buckhead Church). Now despite my newfound optimism, something about being at a singles function on Valentine's Day didn't sound too appealing to me. But since it was Julie that was asking, and she'd already bribed me with candy, how could I say no? Although I was skeptical, that was the very day and the very place that I met Gabe - the love of my life. At first I was certain that he wasn't interested, but fortunately for me, he was. Granted it took him a little while to friend me on Facebook let alone ask for my number, but before long we were inseparable. Where and when I least expected it, I found love and I couldn't be happier. So you're probably wondering what exactly this has to do with the red velvet cookies pictured above. Well, not quite much to be honest. But its Valentine's Day, and what goes better with a love story than some red velvet cookies (sorry they aren't heart shaped). 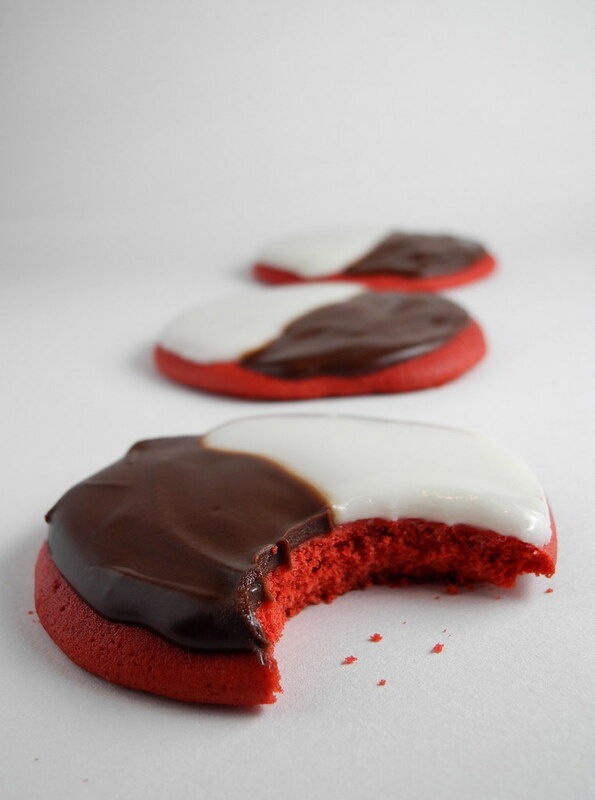 These Red Velvet Black and White Cookies came from a Rachael Ray recipe and they were actually quite good. The recipe is really straightforward, but I'd recommend preparing the pans with grease and flour, as by just using parchment paper my cookies seemed to stick a little to the paper. Also, don't try and add extra hot water to the icing than the recipe calls for...its much easier to spread on when its thick. To all of you, regardless of your status, I hope you have a wonderful Valentine's Day, full of love...and lots of red velvet. UPDATE: Gabe proposed and I said yes (of course)!! We've entered Crate&Barrel's Ultimate Wedding Contest for a chance to win a 100K wedding. Its a long shot, but worth a try. Please vote for us here: http://www.ultimateweddingcontest.com/entry/126647. If we win, you know we will have the most ginormous and tasty red velvet wedding cake ever! Doozie (also doozy): Something that is extraordinary. Often used in the context of troublesome, difficult or problematic, but can be used positively as well. As a kid I always loved going to Great American Cookie Company and getting a Double Doozie cookie. Nothing was better than a generous helping of frosting sandwiched between two freshly baked cookies. Now one could infer that Great American Cookie Company coined the name "Double Doozie" because it is in fact, wonderful and extraordinary, but I beg to disagree. I like to think that this cookie originated after someone was having a horrendous, albeit "doozie" of a day. One of those days when you feel like you just can't... possibly... make... one... more... decision. Do I want a cookie? Yes. Do I want cake? Yes. Do I want an entire vat of icing? Yes. 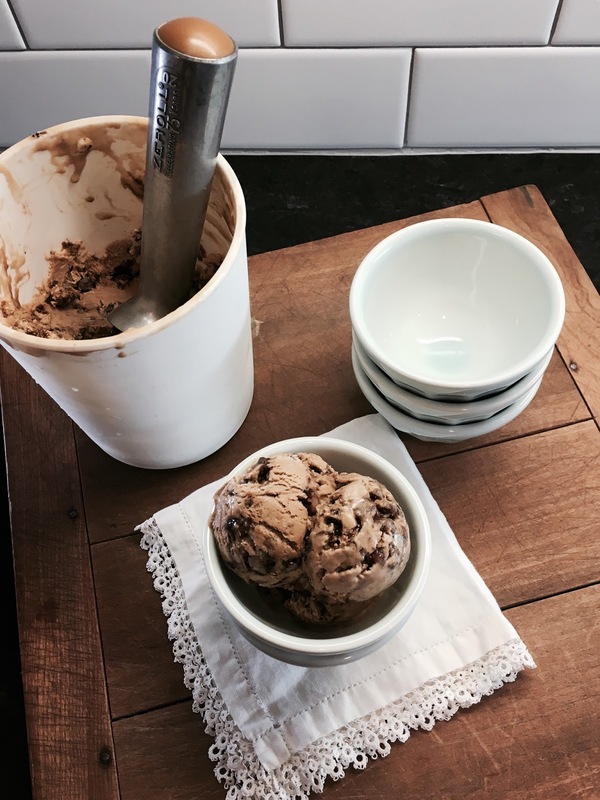 Indulgence kicks in and before you know it, you're sitting with an empty pint of ice cream, spoon-in-hand, wondering why you feel left unsatisfied. Yes, one of those kinds of days.